Modelled after the Panerai watches of the pre-Vendôme era, the PAM00599 commissioned for Revolution pays homage to the Black Seal of the mid-90s. Taking its cue from the most famous of all the pre-Vendôme Panerai watches - the Ref. 5218-218/A Luminor Marina from 1996 – the 50-piece limited edition is encased in DLC-coated steel housing the P.5000 hand-wound calibre providing an 8-day power reserve. The hands and indices are made in ecru to replicate aged vintage tritium and - it goes without saying - coated with Super-LumiNova. 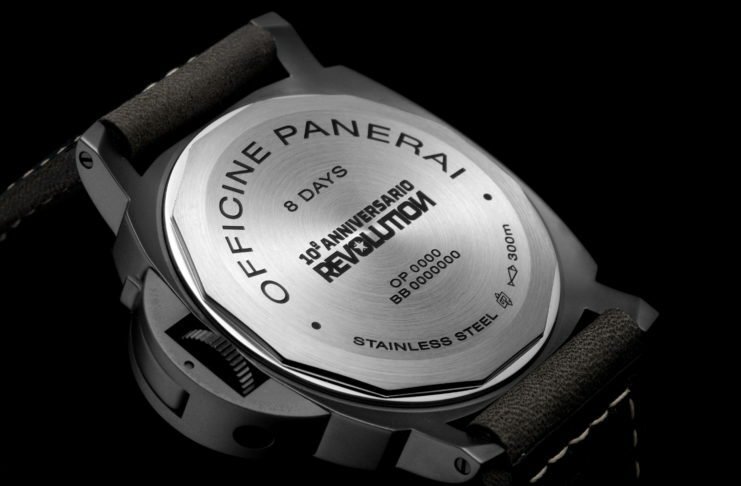 “10° Anniversario Revolution” is engraved on the caseback.